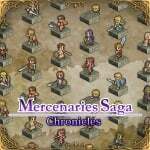 Circle Entertainment has revealed that its tactical offering Mercenaries Saga Chronicles will arrive on the Switch eShop in North America, Europe, Australia and New Zealand on 8th February. This pack includes not one, not two, but three games from the cult tactical RPG franchise, which was inspired by the likes of Tactics Ogre and Final Fantasy Tactics. Pre-orders go live on the eShop on 1st February, with a 10 percent discount for those who pledge their cash early. Pre-order prices will be $13.49 / €13,49 / £12.23; the full launch price will be $14.99 / € 14,99 / £13.59. Will you be pre-ordering this collection? Nice! I expected the price to be $19.99 anyway. So a discount off of $14.99 is a no-brainer for me. 3 Tactic Ogres-lite games in one package at such a cheap price is a steal. Will buy it for sure! I'm also loving those pre-order discount. First Mutant Mudds Collection, then Danadara, and now this? I hope more indies (and even AAA) will do the same! I really I want to purchase this but I'm skeptical on it. People said the story isnt all that strong. hmmm guess I either wait for a review to see if I should get it. Not sure about this one but I'm looking forward to Mercenary Kings which releases this week. Looks much more like my kind of game. Getting it, but wow I ended up lining myself up with a lot of strategy RPGs without even realizing it. I just started doing a Maniac run on japanese FE: Path of Radiance, got Disgaea 5 delivered today and now this. @Prof_Yoshtonics LOL. Being on a mobile platform doesn't negate a game's level of quality. LOL. Developers determine that asset. LOL. NintendoLife has reviewed these games for the 3DS and found them solid entries to the tactic genre. LOL. Price is good and I do love a good srpg. I just can't help but wish it was FF tactics, ogre battle or tactics ogre. What I wouldn't give for a new phantasy star! Hell make a phantasy star tactics and I'd be all over it! Who needs Unsung Story when we already got this great tactical trilogy. You are just figuring this out now @nintendolife? Wow. @brandonbwii They're reporting about it again as the pre-order option and prices for the game have just been announced. They aren't finally reporting that the game exists, if that is your implication. I've been wanting to buy Digaea 5, but didn`t yet. Should i buy this instead? it's a lot cheaper. @Shadeus Disgaea 5 is a gem loaded with content that'll keep you enticed. I can easily recommend it to anyone. That being said, I haven't tried Mercenaries Saga but will be preordering it. Loved ffta etc and have these on 3ds but never finished them. May go back to them sometime. Fantastic price on this collection. I definitely expected at least £15. I will be pre ordering for sure. I gotta quit buying these Indie games, I'm getting a back log and games like this take a long time to clear. With that said I'll be pre-ordering this soon. @Mando44646 Right on. May check them out then. SNES Tactics Ogre looks like a 4K game compared to this. @Captain_Gonru Sadly I no longer do. I may check them out though. £15 for 3 games is a steal and people are going on and on about them. I still have to finish XC2 and Odyssey though. Argh, that 10% pre-order discount is really tempting for a game that reminds me of FF Tactics and Fire Emblem. I might just have to do it. @Shadeus I dropped 195 hours into Disgaea 5 and still have tons of content left to do. The Switch version comes with all the DLC and the game is super comfortable to play on TV or on the go. I HIGHLY recommend it. @gordjscott Now the pre-purchase and release date for the game has been around for about a week now. You just had to boot up your Switch and check the coming soon section. @brandonbwii I'm UK based (as is Nintendo Life, I believe), and we still have no listings for this game on the EU eShop or news section. @brandonbwii This story is based on an official PR issued yesterday by the publisher. Still no sign of this on the eShop. @brandonbwii Erm, it really hasn't been around a week or so I wonder if you'd picked up on the Japanese release details, the JP store got it earlier. Yesterday was the first time we confirmed pre-orders, the pre-order discount and the release date for the 'West'. I plan on preordering this tomorrow! Well, no discount in the scandinavian e-shop so far. Pre-order is available tho so...yay?